Dr Arvind Shenoy, senior chemical and consumer product researcher, had a hunch that Hindustan Unilever was making exaggerated claims about its Pureit water purifier. His suspicions were confirmed by the NIV which has threatened to take legal action if the company does not correct the advertising. That the giant multinational company Hindustan Unilever (HUL) has no qualms about misleading people to sell its product was exposed recently, thanks to the RTI Act. It has even been threatened with legal action for making tall claims that its water purifier 'Pureit' kills/removes one crore viruses in one litre of water. The esteemed institution that has issued this warning to the company is the National Institute of Virology (NIV), which in its letter dated 2nd June has accused it of "twisting and misrepresenting facts". The facts pertain to a study conducted by the NIV "to evaluate the performance of domestic water purification units with respect to contaminating enteric viruses." HUL has, it seems, exaggerated by about 100 times the efficacy (of its water purifier) as tested by the NIV. The letter written by Dr AC Mishra, director, NIV, on 2 June 2011 states: "It is brought to my attention that your company is advertising Pureit regularly on TV. The said advertisement is quoting explicitly NIV's report that the purifier kills one crore viruses in a litre of water. We have clearly reported in our paper that experiments were conducted using 0.67x105 Hepatitis E virus particles per litre of water. Hence, your advertisements are not based on facts. You are requested to refrain from twisting and misrepresenting the facts. Failing to take immediate corrective measures may force us to resort to legal action against your company." Mumbai-based Dr Arvind Shenoy, a PhD in chemistry and a consumer product researcher, with 42 years of professional experience in consumer product testing, both chemical and microbiological, decided to invoke the RTI Act on this matter in October 2010. "It all began with their Rs1 crore safety challenge advertisement, in which the HUL proudly tom-tommed about a test report on eight domestic water purifiers by the NIV. According to HUL, the NIV report claimed that its Pureit water purifier, a gravity-fed water filtration device, was the only water purifier that "removed/killed more than one crore viruses from one litre of water (Ek Crore Virus Ek Litre Pani se Maarta Hai)," Dr Shenoy says. He explains, "I felt an instant apprehension about HUL's advertising claims. Since NIV was a Government of India (GOI) institution, I sought information under the RTI Act, thrice in 2010. After five months of waiting (he got the information on 25 February 2011), I had all the information, which revealed what I had suspected all along! Indeed, HUL had misrepresented, twisted and blatantly lied to gullible consumers about the quality of the Pureit water purifier. The tone of the advertisements on HUL's Pureit now appears to be a calculated exercise in falsehood and deceit in order to coax as many consumers as possible to buy Pureit." Strangely, NIV refused to take action against HUL, even after the RTI revelation. So, on 11 May 2011, Dr Shenoy wrote to Dr Vishwa Mohan Katoch, director general, Indian Council of Medical Research (ICMR), Delhi, informing him that "Unilever Limited also markets Pureit to Indonesia and Mexico, but, in these countries they don't make such tall claims of killing one crore viruses per litre, probably for the fear of the repercussions from their respective governments." The RTI information revealed that HUL was making its water purifier appear 100 times more efficient than what was stated in the report. Dr Shenoy says, "the document procured under RTI makes it abundantly clear that the testing was done with only 0.67x10(5) Hepatitis E Virus (HEV) particles per litre of water and not one crore, that is 1x107 HEV particles per litre of water as claimed by HUL in its advertisements." Asked whether the testing by NIV of the eight water purifier brands was sponsored, V Gopalkrishna, scientist and public information officer at NIV, stated that "it was not a sponsored testing" and that "it was an NIV supported activity". However, Dr Shenoy who has a copy of the test report that was published by NIV researchers in the Journal of Tropical Medicine and International Health, Vol 14, pages 1-7, 2009, suspects otherwise. This is because the brand Pureit has been mentioned in the published test report (4th sentence on page 889). Mentioning a brand in such an internationally reputed journal is a violation of the norms of the US EPA's international ethical and scientific protocol. 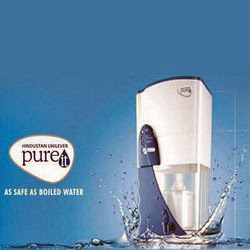 Dr Shenoy observes, "I noticed that, curiously, for reasons best known to NIV researchers, in their published test report study on eight water purifier units in the scientific journal, they have specifically mentioned Unit number eight as Pureit, a water purifier developed by Hindustan Lever Limited. This gives an impression that the study was conducted in NIV at the behest of the manufacturers of Hindustan Unilever. It is not ethical as per international research standards to mention the name of a brand and a company specifically; hence the suspicion." According to information received through the RTI Act, NIV tested eight brands of water purifiers sold in India. The test report was written in the international journal by Vikram Verma and Vidya A Arankalle, both scientists at NIV. (Read the article, "Virological evaluation of domestic water purification devices commonly used in India emphasizes inadequate quality and need for virological standards", from the Journal of Tropical Medicine and International Health. The units tested were: Unit 1 - Zero B, Unit 2 - Eureka Aqua Flow, Unit 3 - Orpat, Unit 4 - Krystalle, Unit 5 - Eureka Aquasure on Tap, Unit 6 - Anjali B-Free, Unit 7 - Aqua Plus (hollow fibre membrane), and Unit 8 - Pureit (from Hindustan Unilever). By the way, the conclusions of the report should open the eyes of people as to how ineffective the water purifiers in India are. It says, "These same samples showed free and total chlorine levels that were adequate to ensure proper elimination of bacterial contaminants, but were unable to remove pathogenic viruses. These reports clearly document a definite need for a separate, well-defined virological standard for drinking water as well as for the evaluation of water treatment plants and domestic water purifiers. "The minimum standards established by USEPA were not designed for developing countries where the microbiological quality of public water supply may not be as good as in developed countries. India and other developing countries should formulate their own standards and ensure strict adherence by all those concerned. This will help both manufacturers and consumers to be quality conscious with respect to drinking water, a basic need for every population and the major source of a variety of infectious diseases taking heavy toll every year in all the under-developed and developing countries. "Similar study needs to be extended to the water treatment plants/systems used in villages, small cities and the metros to truly understand the quality of water made available to the people. It would be worthwhile judging the performance of the domestic units in field, i.e. houses, with respect to water quality, adherence to the recommended maintenance of the units, as well as time period of usage. We would like to point out here that we have evaluated one unit of each type. The batch-to-batch or unit-to-unit variation was not evaluated. This is a limitation of this study and needs to be extended to several units from one batch as well as different batches. "In conclusion, our study suggests that even with the limitation of the study pointed out above, the results indicate that six of eight units tested (one unit/type) do not confirm to USEPA standards and emphasises the need for a definite national policy for the evaluation of such devices by the regulatory authorities as well as at factory level. Such an exercise will ensure availability of quality-assured domestic water purification units to the community, thereby reducing the burden of water-borne infections. It is desirable to set up our own national virological standards as well as evaluation of the protocol developed by us in several laboratories followed by strict adherence to the method accepted and approved by the regulatory authorities." The point here to note is that although the NIV in its letter dated 2nd June has threatened legal action if HUL does not "immediately" rectify the false information, it is nearly two months but the NIV has not yet served even a legal notice to the multinational company. Does that speak loudly of NIV's intentions in conducting the test in the first place? As for Dr Shenoy, he wants HUL to publicly apologise. He has sent HUL a legal notice on 25 July 2011.